Home Decor items have a wide range of possibilities. In this category we will add items as they are requested, created, or available. Some of the items are One of a Kind and some can be ordered, so check back to see what items have been added. 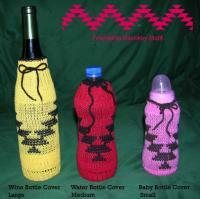 We have had bottle covers, 2 or 4 color pillow sets and cotton table runners. Please click on the photo or product title to read the full product description.